This once -a - week hot oil uses our years of experience in helping your hair get some TLC. With a UV filter, this hot oil will give colour treated hair added vibrancy, whilst doubling your hair's strength to reduce breakage caused by brushing and styling. A great cupboard staple for when your hair needs a pick-me-up. Effective at conditioning and hydrating. This is a product that I have used for years. It is effective at dealing with dry and damaged hair instantly, though there are other products on the market that compete well. To increase hydration, I carry out the first shampoo with the oil still present and then shampoo again. If available, look for VO5 'shower works' version which does not need heating, but does the same thing. I used this after bleaching part of my hair, that part went noticeably dry and you could tell a massive difference from the natural hair to the bleached. This made a huge difference and you could not tell my hair was as bad where the bleach killed it. Would highly recommend this if you are in serious need of nourishment. 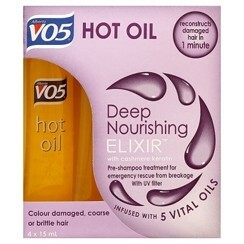 I have used hot oil as anoccasional hair treatment for my sometimes dry curly hair since my teens. "A great cupboard staple for when your hair needs a pick-me-up."